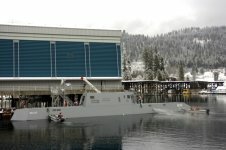 The Sea Jet Advanced Electric Ship Demonstrator (AESD), funded by the Office of Naval Research (ONR), is a 133-foot vessel located at the Naval Surface Warfare Center Carderock Division, Acoustic Research Detachment in Bayview, Idaho. 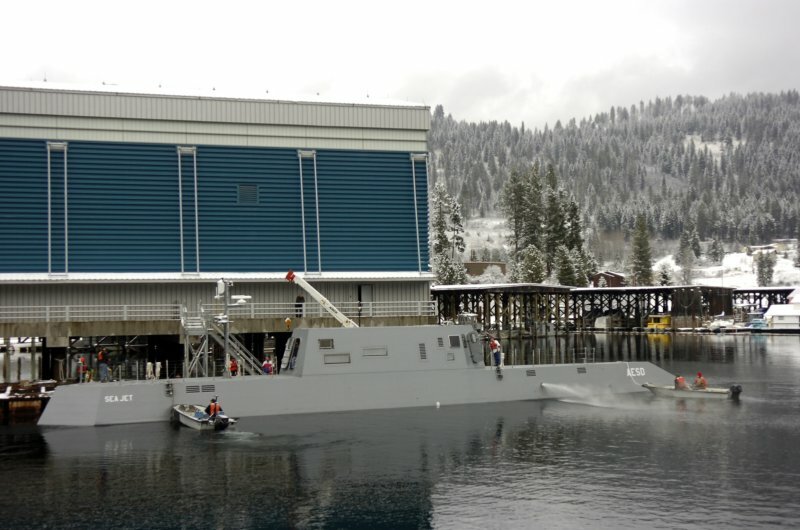 Sea Jet - built by Dakota Creek Industries in Anacortes, Wash. - operates on Lake Pend Oreille, where it is used for test and demonstration of various technologies. Among the first technologies tested was an underwater discharge waterjet from Rolls-Royce Naval Marine, Inc., called AWJ-21, a propulsion concept with the goals of providing increased propulsive effiency, reduced acoustic signature, and improved maneuverability over previous Destroyer Class combatants. 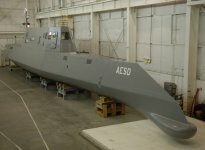 In a program of research and development which was years in the making, Office of Naval Research (ONR), Rolls Royce Naval Marine Inc. (RRNMI), and the Signatures Department (Code 70) prepared the demonstration of an advanced waterjet-based propulsion concept, named AWJ-21. RRNMI, Walpole, MA, has developed the AWJ-21 propulsor concept with the goals of providing increased propulsive efficiency, reduced acoustic signature, and improved maneuverability over DDG 51 Class combatants. 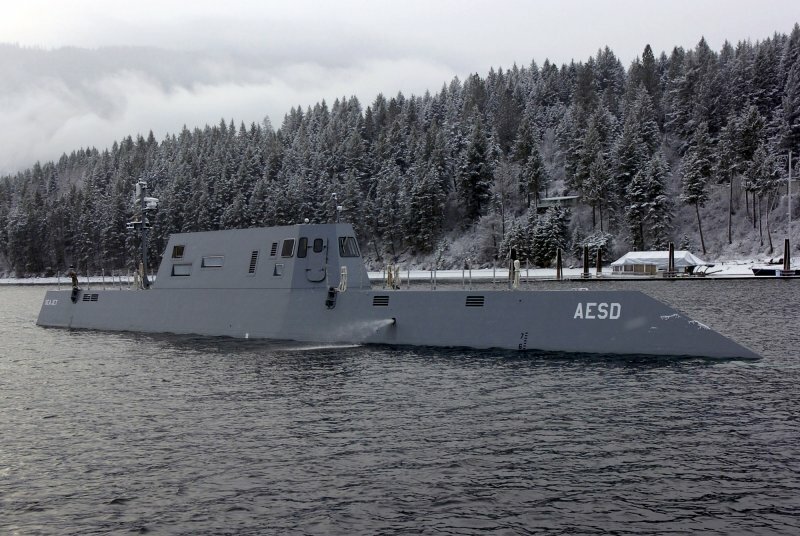 For this demonstration, a 130-foot-long craft designated the Advanced Electric Ship Demonstrator (AESD) was built. The AESD is being funded by ONR to demonstrate advanced electric ship and propulsor technologies. The ground-breaking demonstration is sponsored by the Office of Naval Research. Additional benefits from the AWJ-21 technology are expected to provide more compact propulsion systems with reduced weight and volume. 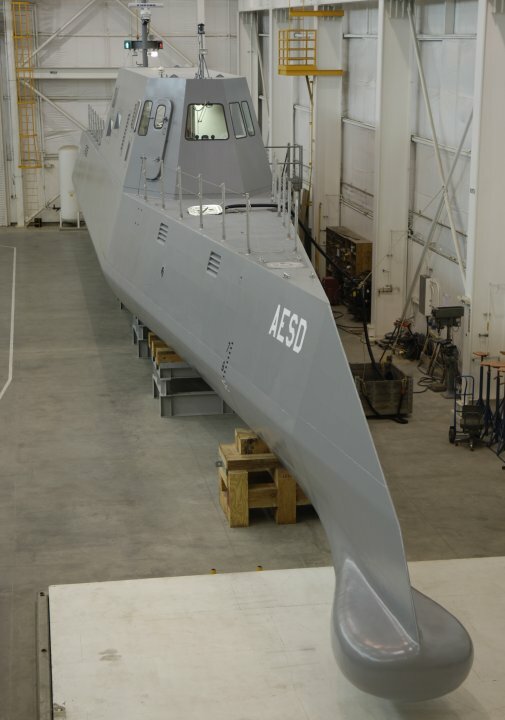 The AESD is an approximate quarter-scale destroyer class combatant with a length of more than 133 feet and a full load displacement of 120 tons [239,000 pounds]. The AESD hull form is based on the 5565 tumble-home hull tested early in the DD(X) program. As a result of availability of the AESD demonstrator craft, planning is underway to conduct other technology demonstrations. One such effort is the design of a low signature deckhouse for the model. The Advanced Electric Ship Demonstrator (AESD) was christened on August 24, 2005. The ceremony took place at the Naval Surface Warfare Center Carderock Division, Acoustic Research Detachment in Bayview, Idaho. Chief of Naval Research Rear Admiral Jay M. Cohen delivered the principle address at the christening. The ship's sponsor was Kathleen Harper, wife of Thurman Harper, vice president of engineering for Rolls-Royce Naval Marine, Inc. In the time-honored Navy tradition, she broke a bottle of champagne across the bow to formally christen the ship "Sea Jet." 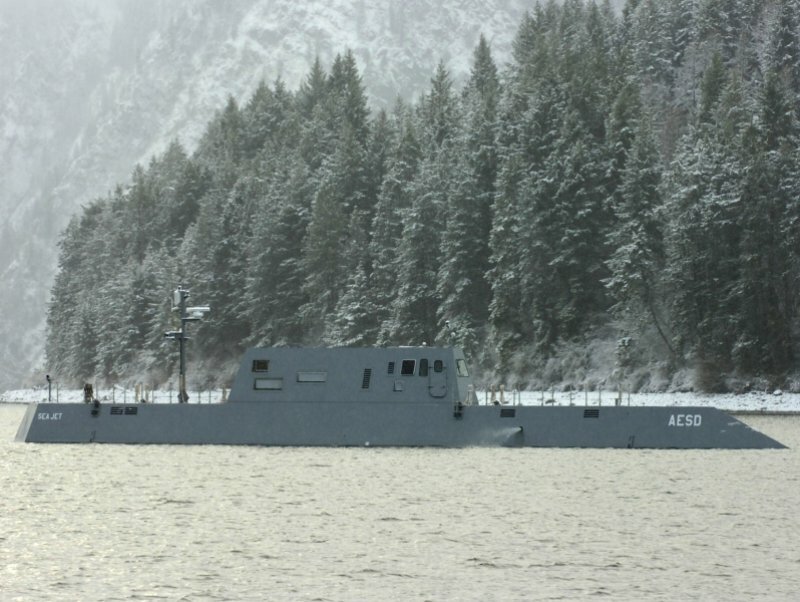 On 30 November 2005 the Advanced Electric Ship Demonstrator (AESD), Sea Jet, tied-up to the pier after completing its first day of sea trials on Lake Pend Oreille at the Naval Surface Warfare Center Carderock Division, Acoustic Research Detachment in Bayview, Idaho. 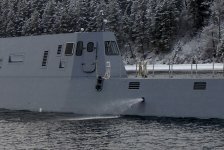 The ship would test Rolls-Royce patented AWJ-21T waterjet technology over the following six months on Lake Pend Oreille at the Navy's Acoustic Research Department in Bayview, Idaho. The AWJ-21 is designed to increase ship speed, making hulls sleeker by working without rudders, shafts and propeller struts. Unlike conventional waterjets, the system works completely underwater, reducing noise and surface wake and improving stealth. 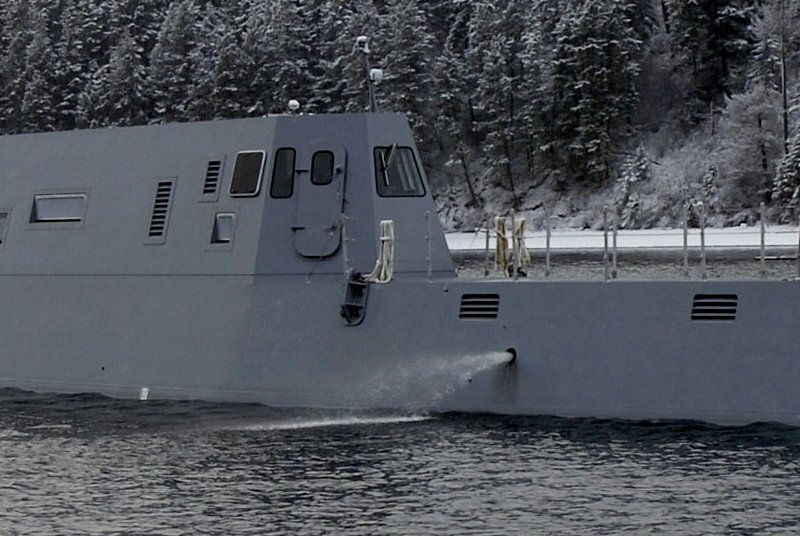 The lightweight and compact AWJ-21 allows ships to operate in shallow waters. Its integrated steering and reversing system improves maneuvrability at low speeds. Carderock Division's Acoustic Research Detachment in Bayview, ID, is where most of the testing commenced in FY 05. Members of Philadelphia's Code 90 supported machinery and electric drive quieting for the AESD. General Dynamics Electric Boat division similarly applied its expertise to the electric drive propulsion system. ARL at Penn State provided test support for the early waterjet development, and MIT assisted with the waterjet pump design. Computer Sciences Corporation (CSC) is responsible for the overall AESD boat design. AWJ-21 testing was conducted at the Large Cavitation Channel in Memphis, TN, in mid-FY 05. 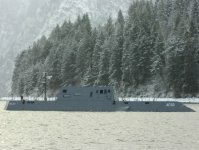 By mid-May 2006 it was reported [Stealth prototype drawing attention The Idaho Statesman 05-14-2006] that the Sea Jet Advanced Electric Ship Demonstrator had been operating on Lake Pend Oreille for 16 straight days, cutting through three-foot waves with a new hull design that splits the water like a razor. 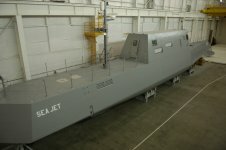 Following the AWJ-21 demonstration, General Dynamics Electric Boat division and Carderock Division would conduct a demonstration of the GD/EB RIMJET propulsor on the AESD. 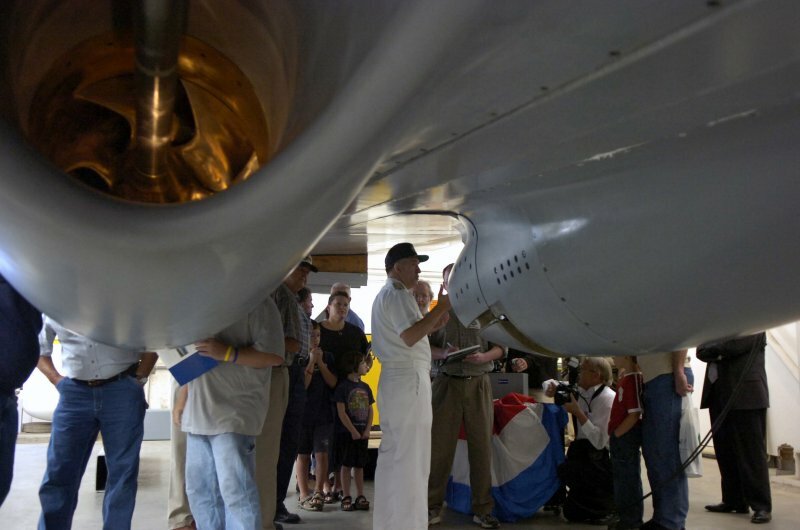 The RIMJET is a novel type of podded propulsion system that relies on a permanent magnet motor to drive the propellor. The RIMJET is a novel type of podded propulsion system that relies on a permanent magnet motor to drive the propeller, making it similar to the systems featured in this issue of Solutions (p32). In the RIMJET propulsor the motor is mounted not in the hub but in the rim, which GD Electric Boat believes provides a number of advantages. One of these is that because the RIMJET makes use of the same hydrodynamic principles as a waterjet, its applicability to high-speed vessels is much greater than conventional propulsors. Advantages over waterjets include high rotor torque capacity, rim attachment of rotor blades, minimal hull contour impact and azimuthing capability. The RIMJET's high efficiency derives from its use of a phenomenon known as swirl recovery. Moreover, because it operates at a relatively low rpm, blade area is reduced, there is minimal duct and strut surface area, and the propulsor has low duct and strut velocities compared to hub-driven propulsors. The RIMJET has excellent cavitation performance because it operates at low rpm, it has very uniform inflow to the rotor, and the rim prevents the formation of tip vortexes. General Dynamics believes the RIMJET will also have better 'off-design' performance characteristics because the duct provides uniform mass-flow at off-design conditions. It also promises to be much more reliable and maintainable than hub-driven pods. GD Electric Boat says the 'canned' permanent magnet motor at the heart of the RDP and stator are both sea-water cooled, eliminating the need for a cooling system and anti-condensation heating system. Having a seawater-lubricated journal and thrust bearings removes the need for a bearing lubrication system and seals, and having the strut outside the propeller wake reduces cavitation erosion. 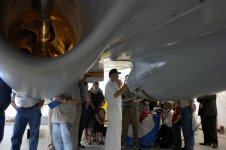 The duct also shrouds the ship's hull from blade-induced pressure fluctuations.